Extra Chilli Slot - Spin for 117,649 winning possibilities! 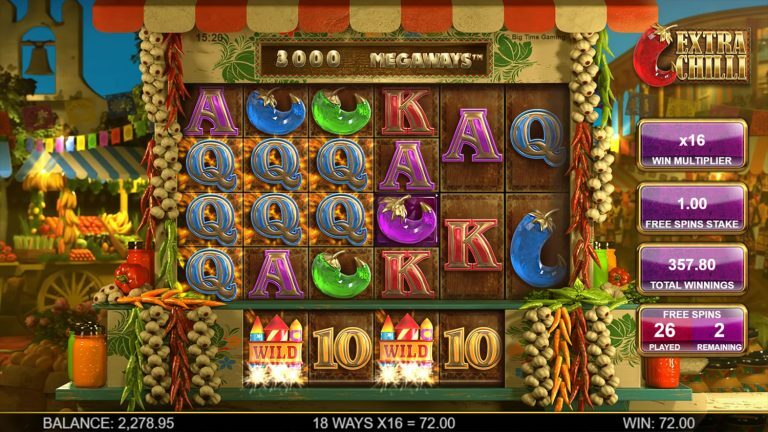 In this review, we head over to Mexico for one of Big Time Gaming’s best slots: Extra Chilli. This exciting slot game has the action-packed streets of Mexico as its setting. 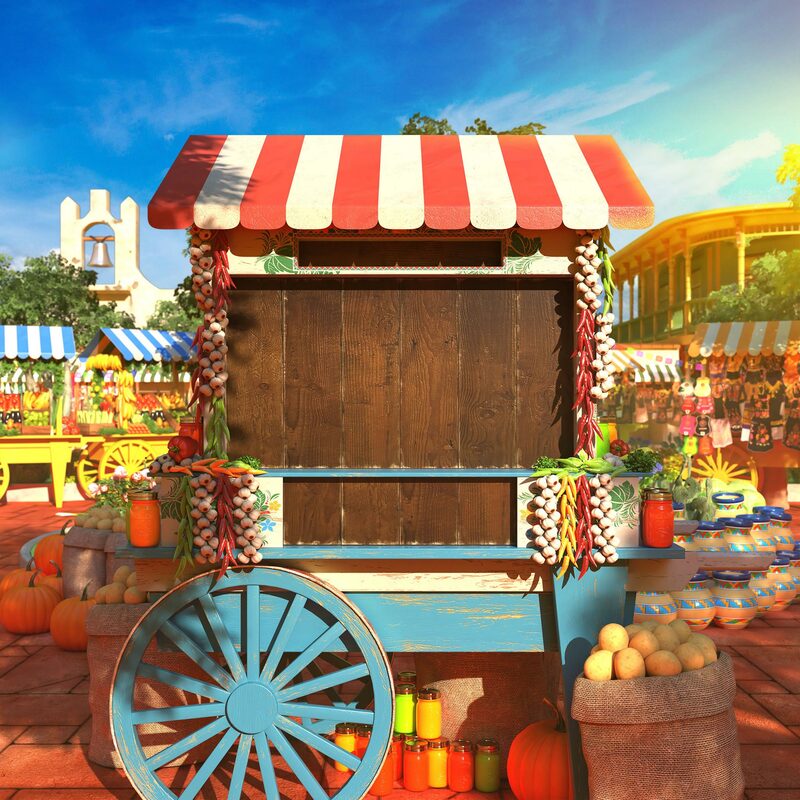 Once you open up the game, you are immediately immersed in the sights and sounds of a bustling marketplace, complete with food stalls. The colourful reels are positioned within a market stall surrounded by onions, peppers and chillies. Ready to play? Spin the reels, collect the brightly coloured chillies and get ready for some spicy winnings! Red-hot and Mexican-themed, Extra Chilli is one of the most innovative slots by Big Time Gaming. The game is built on BTG’s Megaways gaming engine, which varies the number of ways you can win with every spin. At its most, it gives you an incredible 117,649 different ways to win. With each spin, the number of rows changes but you will always find an additional row beneath the second, third, fourth and fifth reels. What it means is that the number of potential winning combinations change every time you spin. It is possible to see the number of winning Megaways above the reels. Once you land a winner, the winning symbols are eliminated, and new ones are dropped in to replace them. This process goes on until you have a drop with no more winning combinations. An interesting and unique option is the “Feature Drop™”. Instead of waiting for the free spins feature to occur, you can actually buy the feature at any time for the amount displayed, near the bottom left, next to the reels. A value is shown with a buy button. The amount will be deducted from your funds balance and the free spins will begin. Also, take note during regular play, at random, gold coins will be awarded which jump across to “feature drop” and reduce the amount you need to pay. If the balance eventually reaches zero, the feature will start automatically. As mentioned, the game’s reels have a Mexican market stall as the backdrop, and feature low value playing cards, 9 to A, as well as four crystal-styled chillies of different colours which also give the biggest wins. As you may have guessed by now, Extra Chilli has none of the traditional bar, cherry or 7 symbols. However, the symbols you really need to know about are the beautifully-designed chillies, which offer premium payouts. Among the chillies, the best is the purple chilli that multiplies your stake 2, 5, 10, 25 or 50 times if you land on a combination of 2, 3, 4, 5 or 6 chillies. The fireworks symbol is the wild, which handles the usual substituting. Although Extra Chillies does not feature an out-and-out bonus round feature that you may find on other slots, it uses the “HOT” free spins described below, which many players consider as a bonus. If you want to activate your free spins round on the Extra Chilli slot game, all you need is the golden letters H-O-T anywhere on the reels. You will then be presented with a Free Spins wheel. You may choose to collect your default 8 free spins, or you may decide to spin the wheel and gamble to get more spins. With each successful spin, you get 4 more free spins. You can continue to gamble for more spins, but you also stand the risk of losing them all. Extra Chilli does not feature a dedicated jackpot, neither does it have any link to any progressive jackpots. One of Extra Chillies’ highlights is the astounding number of paylines available. Most other online slots feature a fixed number of paylines, but the Megaways engine continually changes the reels, giving you a whopping 117,649 winning possibilities. The Return to Player (RTP) for Extra Chillies varies from 96.15% to 96.82% depending on playing strategy. This figure is fairly standard for slots in its class. If you are patient and feel like taking big risks for big rewards, you will feel right at home with Extra Chilli. The game is highly volatile and, as a result, it is possible to win as much as 20,000 times the amount you stake on each spin! While the game’s theme is fresh and well-designed, Big Time Gaming should have included more human elements to really bring the design to life. What definitely is lively and very much alive, is the game itself. Extra Chilli holds potential for exciting action with each spin and the varying number of betting lines is eye catching. If you are able to handle a highly volatile game environment and are patient enough to wait for big wins, this extra-spicy game offers plenty of rewards.